A puzzlescript game that I expected to be nothing but memes for 5 levels straight, but actually turned out decent. Has 11 levels of varying difficulty. Made it in two, maybe three days. 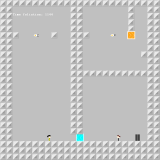 In the spirit of the advent of Portal 2, which was released a few minutes ago in the future, here is a two-dimensional version of the game. The story is different, and so are the puzzles. I tried to make as many levels as I could in the time limit. There are 10 of them. Z - Push against ground, thus forcing self upward as per Newton's third law. Arrows - Impart motion upon self, or, conversely, aim the object held in hand (if any).